Driving into Rio de Janeiro from the airport, I wasn’t sure if we were going to like the city. 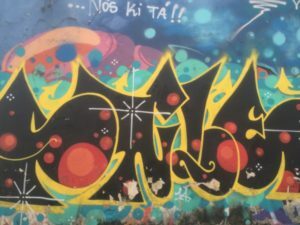 There was graffiti everywhere, lots of traffic, and lots of people (6.5M in the city, 12M in the Metro area). However, after living in a village in the Andes, we quickly appreciated all the conveniences this big city has to offer. We liked having restaurants of various price ranges, the supermarket, post office and a playground close by. 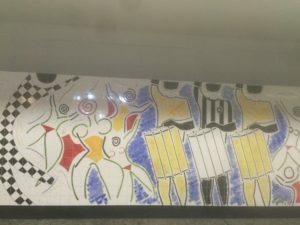 The Metro subway station and the vans that take you up Corcovado mountain to the Christ the Redeemer statue were also right there. Staying in a small apartment (70m2), gave us a good idea of what big city life is like for a lot of people. The apartment had a washer, but no dryer, just a dry rack suspended from the ceiling that you could raise and lower. One thing we noticed right away, was the popularity of Sucos or fresh juices. Fresh juice shops are everywhere! I never knew there were so many different kinds of fruit. I tried my first passion fruit (just the fruit), as well as soursop juice. 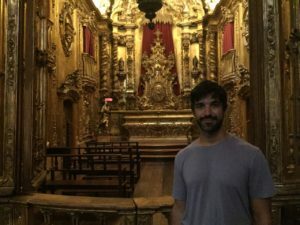 In terms of weather, Rio is very hot and humid (even in winter), but the beautiful beaches and beautiful surroundings make up for the heat and humidity. 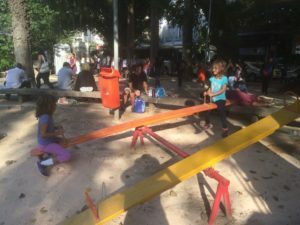 Although you won’t find a lot of big grassy areas throughout the city, you will find mini-playgrounds, which my girls liked. 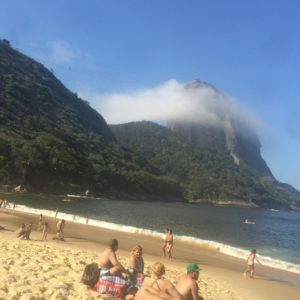 On Sundays, the streets that run along Copacabana and other beaches are closed to cars and opened up for walkers, and cyclists. The people are friendly and helpful and we always felt safe, but then again, we weren’t out at night. We liked that body sizes of all types are welcomed in Rio de Janeiro, particularly at the beaches. 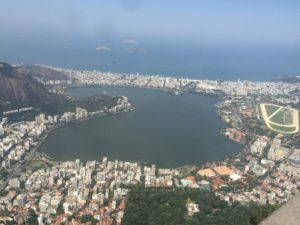 Although the beaches were the best part of Rio for the girls, I think they also enjoyed the aerial tram up to Sugarloaf Mountain and the bicycle built for 4 that we unsuccessfully tried to navigate around part of the Lagoa. 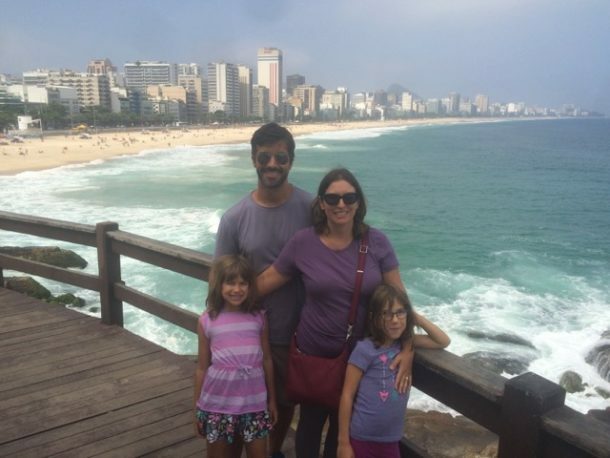 We wanted to take the cog train up Corcovado mountain, but the timing didn’t work out. 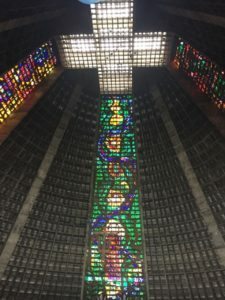 On our half day tour of Rio, we managed to stop by Parque Ruinas in the Santa Teresa neighborhood, the cathedral whose design was inspired by the Apollo spaceship, a Monastery gilded in gold, the aqueduct, the famous tiled stairs, and the lagoon. Overall we’ve enjoyed our time exploring the city. 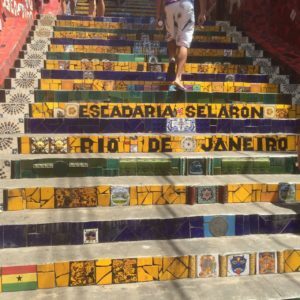 The more time we spent in Rio de Janeiro, the more we came to love it! 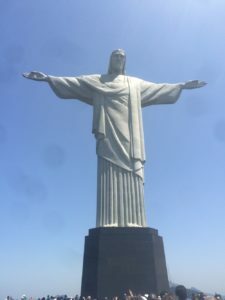 Christ the Redeemer statute was a gift from the Catholics of Rio to the city.